As the polls were about to open in Newfoundland and Labrador, on May the second, I posted one last, "Good Luck Canada" to my Facebook friends on CRUSH. If you are unaware, that stands for "Canadians Rallying to Unseat Stephen Harper", a Facebook group dedicated to the defeat of the Harper Government in the General Election then only moments away from fruition. I quickly added: "See ya when the polls close." The reason for timing it thusly was a simple one. CRUSH was about to go into hibernation and would stay there during the hours in which any Polls in Canada were open for business. It is the law of the Land!CRUSH it seems, was registered as a third party by Elections Canada, as it was conducting advertising in Print and other media, and was required to maintain what could be metaphorically called "Radio silence" during that time frame. We all agreed to this as we all, all 7350 or so of us agreed that that is a very necessary incovenience to protect Democracy. It was a noble response by a noble group of Canadians dedicated to researching and documenting the record of the then Minority Harper Government. These are bright people. They are people from all walks of life who simply did not approve of the long long list of items that make up Stephen Harper's five year record of anomalous activities. To get a better sense of this record you can read some of the posts on this blog, or get involved with other Canadians as we had done at CRUSH. 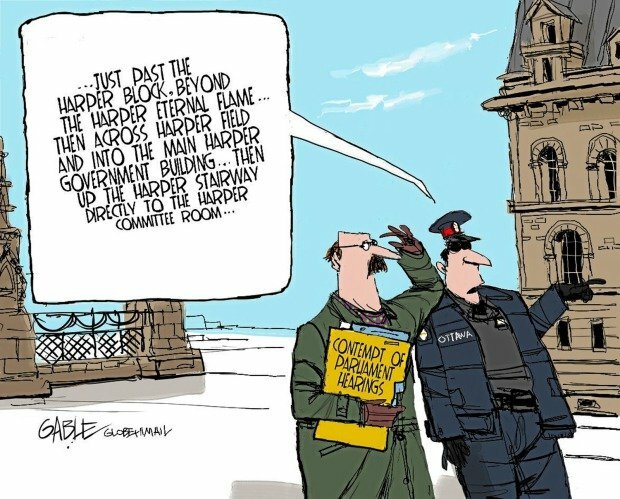 Just leave your preconceptions at the door, pull up a keyboard and delve into the truth of the Harper regime. It is entirely up to you if you wish to maintain that the "In and Out Scheme" was just an "Administrative Dispute" with Elections Canada, as Stephen Harper and his defenders contend. besides all the evidence says otherwise. You'll figure it out. Has that Information disappeared or is facebook sitting on it? Or as I am hearing some speculate, is it in the hands of right winged governments the world over? I don't know that, but the truth will come out. It always does. Sadly, Not everyone plays by the rules. The CBC is, at our and others' insistance, being investigated﻿ for having breached that Blackout. Also the Leader of the Conservative Party of Canada was actually on the Radio during the voting and apparently was campaigning for all his little blue sweater vest was worth. "I meant go it alone Ms. M....., only in the sense that when you get taken out in large numbers, as in having a group like CRUSH down, the only thing that can be done is to blog it! I want to take my time and get it right, but I started a new Facebook "Fan" Page for " The Twain Shall Meet " It's my blog! We need to become more resourceful. We need to have 5000 friends in Common. That way we cannot be separated. I suggest that each of us spend the next few months making personal connections and re-connecting with group members that are no longer accessible. We cannot let this get to us. As long as we are reasonably discreet and speaking the Truth, No one can legally shut us up! The day that Harper starts harrassing people who just happen to have a better understanding of democracy than he does, is the day that we start getting Canada back!" So, the game continues. Harper thinks he has fooled us. He has fooled many of us. He has not fooled all of us! He is still Contempuous, he is still Canada's Biggest Problem. Just do the research. THIS is a LINK to this Blog's fan page NOW On Facebook Join me there, or On My Wall.